Today's Little Ditty is more than a children's poetry blog, it's a poetry playground. Each month, a lively community of writers, teachers, librarians, and poetry-appreciators gathers to take part in the Ditty of the Month Club (DMC). Writing to prompts by successful authors and editors, they participate for the camaraderie, and for the joy and craft of writing poetry. In The Best of Today's Little Ditty: 2016, nine "ditty" challenges by contemporary children's authors, including Jane Yolen, David L. Harrison, Marilyn Singer, Kenn Nesbitt, Douglas Florian, Amy Ludwig VanDerwater, and others, have inspired these 75 poems, deemed "best" by their peers. They range from lighthearted to thought-provoking and appeal to a wide audience, from children to adults. Join the fun at michellehbarnes.blogspot.com. "Sometimes a poet needs a bit of smooth transition into another poem, sometimes a kick to the rear. Today's Little Ditty supplies both. This goes for old poets as well as new "
"Writing with Michelle feels like I'm participating in a workshop. I've learned so much from keeping up with Today's Little Ditty." "How to build your skills as a children's poet? 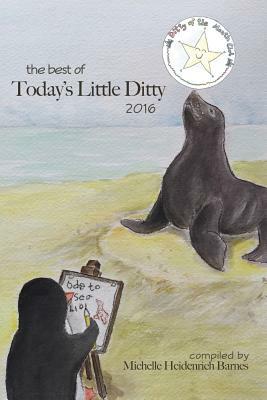 Read anthologies The Best of Today's Little Ditty is a great tutorial because each section contains several poems written from the same prompt. Maybe you'll find the best thing of all: that you write like no one other than yourself." - Janet Wong, children's poet and co-creator of The Poetry Friday Anthology and Poetry Friday Power Book series. Michelle Heidenrich Barnes is an award-winning children's poet and anthologist. Her work appears in magazines and anthologies, including One Minute till Bedtime (Little, Brown Books for Young Readers), Here We Go and The Poetry Friday Anthology for Celebrations (Pomelo Books), and forthcoming collections from Charlesbridge and National Geographic. She has been blogging about poetry at Today's Little Ditty since 2013.